The printing press has a long, interesting history. The printing press has been in use for around 600 years. It has played a crucial role in the spread of literacy and the development of culture. Nowadays, the printing press is essential not only for printing books, but also for making promotional pamphlets, instructional guides, decorative posters, and so much more! To really understand the value of the printing press, it’s important to look into its deep and storied history. In 1377, the first metallic movable-type press was used in Korea to create a book called the Jikji. Around 1440, the printing press was introduced to the West by Johannes Gutenberg. Gutenberg was a goldsmith who figured out how to create a hand mold that would produce movable metal type. Thus, the printing press was born in the West. 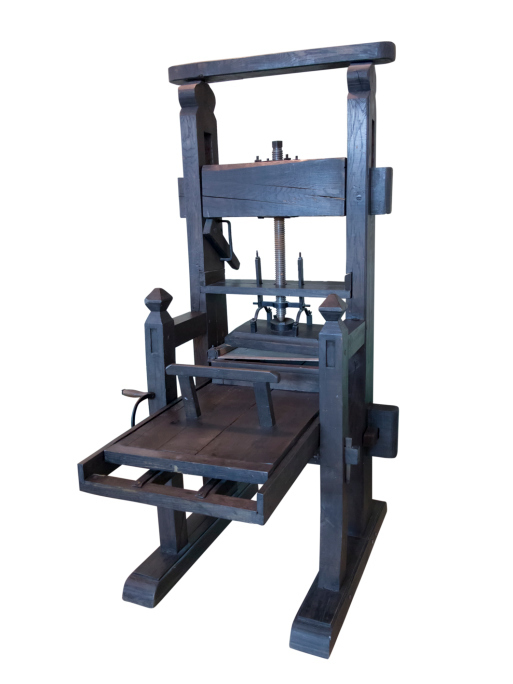 Gutenberg’s press could produce an impressive 3,600 pages per day, compared to the 2,000 pages produced by the movable-block press in Korea. Within a few decades, Gutenberg’s press had spread to over two hundred European cities. By 1500, printing presses in Europe had produced more than twenty million volumes. The newfound high production rate of books meant that books and pamphlets were easier to purchase or distribute. With the availability of reading material, literacy in Europe increased and ideas and opinions were easier to share. By the Victorian era, the old, hand-operated Gutenberg press had been replaced by a more modern steam-powered rotary press. For the first time, printed material could be produced on an industrial scale. This was when newspapers and advertising began to gather traction. By the 18th century, newspapers were publishing articles and essays about topical issues. The middle class became a strong readership as they started to participate in the exchange of ideas and news. Readership of newspapers and gazettes were high, and the demand was insatiable. This led to many companies using newspapers as prime real estate for marketing. As the press began to change, grow, and evolve, so did advertising. Many advertisers experimented with different styles of type and design in order to capture audience’s attention. Advertising became somewhat of an art form, with heavy experimentation and innovations. Today, that innovation in printing continues to thrive. There are three types of rotary presses that exist today: the offset, rotogravure, and flexo press. With the advent of computers, the printing press is more varied and dynamic than it ever has been. The digital printing revolution has lead to more options and freedom for the printed word. Printing presses today offer a wide variety of services, from industrial printing to book binding to text formatting. This entry was posted on Monday, January 11th, 2016	at 8:07 pm	and is filed under History of the Printing Press	. You can follow any responses to this entry through the RSS 2.0	feed. Both comments and pings are currently closed.